"Maidens who pledged their lives to steel, cut through evil and show the way to justice!" Known as Sakura Taisen in Japan, this is a franchise starting with a series of Strategy RPG video games by Sega (starting on the Sega Saturn) and RED Company (Red Entertainment), branching out into OVAs, several TV series and a movie. The games, now at their sixth release in the series, are a combination of Dating Sim and tactical combat, and have a near-fanatical following. Though most have seen no release outside Japan, the first two games were officially released in Russia in 2006 and 2008 respectively, and the fifth game was released in North America on March 30, 2010. Set in an alternate world, it is the 1920s. Instead of World War I, in 1918 an occult conflict called the Demon Wars pitted hellish creatures from another plane of existence against a plucky Four Man Band. Although the humans won, half the Band was lost. With international approval, Japan continues advancing its groundbreaking steam-powered technology, preparing for the demons' inevitable return. In Japan, these preparations take the form of the Teikokukagekidan, the Imperial Floral Defense Force. The Hanagumi ("Flower Division") is their elite squad of warriors, equipped with the steam-powered battle armor called kohbu, and the weapons and skills needed to fight the demons when they return. Because of a quirk in the part-magical technology of the kohbu, all the members of the Flower Division (save for their commanding officer) are women. Taking advantage of a pun in Japanese ("Teikokukagekidan" can mean "Imperial Floral Defense Troop" or "Imperial Theatrical Troupe", depending on the kanji used), the Flower Division make their headquarters underneath the Imperial Theater in Tokyo. When they are not fighting the forces of Hell, they maintain their cover identities as the cast and crew of the theater, allowing for a lot of music in between the battle scenes, and no small amount of incidental comedy. As the series progressed, the successes of the Flower Division led to the establishment of additional teams in other locations, including Paris Combat Revue and the New York Combat Revue. Despite the Flower Division's purpose as a combat unit, Sakura Wars spends surprisingly little time in battle. Instead it focuses on first the background and establishment of Wars Imperial Defense Forces, the recruitment of its members, and follows that with close studies of the various characters. There are two OVA series covering the Tokyo Flower Division; the first is a prequel depicting the formation of the Flower Division, while the second series barely even mentions the demon conflict, instead focusing entirely on specific incidents within the lives of the Flower Division and jumping among the time periods covered in the various video games. The latter series is more self-contained than the first, and showcase the sense of "family" among the Flower Division. In both series the animation is outstanding, and the English dubs (produced by ADV Films) are quite good, featuring a cast that manages to deliver the multinational/multicultural feel of the team quite well. There are also a third and fourth set of OVAs, focusing on the new Flower Division team established in Paris, France. The third series has been licensed by Funimation, and was released under the name Sakura Taisen: École de Paris in North America in late 2005. The fourth series is named Sakura Taisen: Le Nouveau Paris, and continues following the Paris Flower Division. The fifth series of OVAs (based appropriately enough on the fifth game) is titled New York, New York, with a new adventure for the New York-based Star Division. In addition to the OVAs, there is a movie, released in 2001. Like the episodes of the second series, the film is also a self-contained story in the same continuity (no Alternate Continuity here, thankfully) and leaves no hanging plot threads behind; the new character introduced here even goes on to appear in the later Sakura Wars V game. The movie also substantially expands the world of Sakura Wars beyond Japan, exploring in greater depth the dynamics of the prototype team fielded in wartime Europe. The movie takes place just after the end of the third game (Paris) and before the beginning of the fourth (which ended the "Tokyo arc"). This makes extensive use of CGI effects, particularly for the kohbu. Geneon (then known as Pioneer) licensed and dubbed the movie instead of ADV Films (Note: Funimation now owns the license to the film, along with other titles by Geneon), along with different voice actors and less attempts to provide diverse accents that ADV did. There is also a TV series version which is an Alternate Continuity from the OVAs. Produced by Madhouse and aired in Japan in 2000, it follows the plotline of the first game but with multiple (and major) alterations, particularly in the personalities of the villains and some of the principals themselves. The TV series bears an overall darker tone than even the original games. The manga, which was released in Japan from 2003 to 2008 and adapts the first game again, without the drastic alterations of the TV series. Most of it has been released in English by Tokyopop. However, a few volumes were not translated since the company ended a majority of its operations. A motion comic production of the manga adaptations i done by TOMOTOON. However, you can only get it in Japan. An enjoyable, fun, and well-heeled franchise, Sakura Wars is a legendary license and is one of the few franchises to make a truly successful expansion into nearly every form of media. The series' voice actors regularly performed (up to 2008) in sold-out Broadway-style "live shows" and radio dramas (all set in the Sakura Wars universe), and a Sakura Wars cafe/store stood in the SEGA amusement center in Tokyo until its closing in March 2008. An attempt to localize the series for digital distribution has sprung up . There's also an ongoing fan translation project for Sakura Wars 1's PC-version done by Iwakura Productions. Ichiro Ohgami, Sakura Shinguuji, Erica Fontaine, and Gemini Sunrise also made an appearance in Project X Zone, a cross over game between Bandai Namco Entertainment, Sega, and Capcom. They return for the sequel as well, bringing none other than Segata Sanshiro with them. At SEGA FES 2018 (over a decade after the release of Sakura Wars V), a sixth mainline entry was finally announced, tentatively known as Project Sakura Wars and slated for a worldwide release in Spring 2020. Sakura Wars (1996, Sega Saturn): In 1923, Ichiro Ohgami, a fresh-faced Imperial Navy Ensign, is assigned to the Imperial Combat Revue, a clandestine organization dedicated to defending Tokyo from the threat of demonic invasion. Joining him are swordswoman-in-training Sakura Shinguji, haughty aristocrat Sumire Kanzaki, feisty Okinawa-born martial artist Kanna Kirishima, French psychic prodigy Iris Châteaubriand, Chinese scientist Kohran Li, and Russian sharpshooter Maria Tachibana. Sakura Wars 2: Thou Shalt Not Die (1998, Sega Saturn): Two years after the first game, a new demonic threat arrives, pressing the Imperial Combat Revue back into service. This time, they are joined by Orihime Soletta, an Italian actress; and Reni Milchstraße, a German tactical genius. Sakura Wars 3: Is Paris Burning? (2001, Sega Dreamcast): When a supernatural menace threatens Paris, Ohgami is dispatched to the City of Lights to aid the fledgling Paris Combat Revue. Under his command are Erica Fontaine, a clumsy but spirited nun; Glycine Bleumer, a noblewoman; Lobelia Carnili, a notorious criminal; Hanabi Kitaoji, a grieving widow; and Coquelicot, a Vietnamese orphan. Sakura Wars 4: Fall in Love, Maidens (2002, Sega Dreamcast): No sooner does Ohgami return from his mission to Paris does a new threat emerge in the form of a golden spirit armor terrorizing the capital! It will take the combined might of the Imperial and Paris Combat Revues to save the day! Sakura Wars: In Hot Blood (2003): A remake of the first game developed by Overworks and the first to be developed for the PlayStation 2. Sakura Wars: So Long, My Love (2005): In 1928, Ohgami's nephew Shinjiro Taiga, a fresh-faced Navy graduate, is dispatched to America to aid the fledgling New York Combat Revue. Joining him in protecting the Big Apple are Gemini Sunrise, a Texan cowgirl and samurai aficionado; Cheiron Archernote Named Sagita Weinberg in Japan, a Harlemite gangster-turned-lawyer; Rosita Ariesnote Named Rikarita Aries in Japan, a feisty bounty huntress from Mexico; Subaru Kujo, a mysterious and androgynous Japanese actress; and Diana Caprice, a frail but spirited physician. The first game to be developed by Sega's GE2 division, it was also the first to be released in North America for the PS2 and the Nintendo Wii. Shin Sakura Wars (2019): In the 1940s, a new generation of the Imperial Combat Revue, led by Seijuurou Kamiyama, must rise to protect Tokyo. He is joined by Sakura Amamiya, a fan of the original Revue; Hatsuho Shinonome, a foul-tempered shrine maiden; Azami Mochizuki, a prodigious shinobi-in-training; Anastasia Palma, a reknowned Grecian actress; and Clarissa "Claris" Snowflake, a Luxembourg-born scholar and magician. The first game to be developed by Sonic Team for the PlayStation 4. Character tropes go on to the Character Sheet. Nothing to do with the manga called Sakura Discord. At one point, Kayama brags that he's the man who makes the impossible possible; makes sense, given he's voiced by Takehito Koyasu. Noriko Hidaka, who voices Erica, had already played an optimistic French character before. It's not the first time that Colleen Clinkenbeard, who voices Glycine, has played a blonde woman who fights in blue. All There in the Manual: The first illustration book details that the demons were originally caused by Hōjō Ujitsuna's failed experiment back in 1524. They were first detected in 1536. It's uncertain exactly when the world of Sakura Wars diverged from ours, though it may have been several centuries ago; at one point in the manga, Yoneda finds references in an old history text to a war fought between Japan's samurai and supernatural enemies resembling the demonic entities. Possibly a case of Parallel History, as many nations and events seem to be identical or similar to our world; for example, Yoneda is cited as being a great hero of the Russo-Japanese War, and Maria comes to the team as a veteran of the Russian Civil War. There was also a mention that the British Empire (aka the British Colonial Empire) exists in the ST world. The most immediate divergence though would be the Demon Wars of 1918, which take the place of World War I.
Hiroi also mentioned that the ST verse does not have the Great Kanto earthquake nor a pro-ultranationalist military in the government. Another bigger divergence in the upcoming Shin Sakura Wars, as it will take place in the 1940s, while still in the Taisho era.note This is especially relevant here for many reasons: The real emperor Taisho, aka Yoshihito, died in 1926 and the emperor Showa, aka Hirohito, was the one who lived in that time period in his place. Also, keep in mind the emperor Taisho of the Sakura Wars universe is very likely not the same one as the Real Life one, as the kanji of his name is quite different from the real one. That could mean either World War II never happened in this setting or it happened in a very different fashion, just like the previous Demon Wars. Ancestral Weapon: Sakura's sword, Ayame/Kaede's sword, Yoneda's sword, Yamazaki's sword. Anime Accent Absence: Averted in the dubs of the various OVAs and TV series, but strikingly obvious by comparison in the (Pioneer) dub of the movie. An Axe to Grind: Glycine's weapon, a poleaxe to be precise. Anime Theme Song: One of the catchiest anime songs of the nineties — a bizarre but effective mix of rock, pre-war J-pop, and idol charm, with an oddly compelling martial aspect. Artistic License  History: There was no World War I, yet the Russian Revolution of 1917 still somehow happened despite the fact that Russia's constant failures in WWI were the chief reasons that the revolution happened in the first place. If not for the war, Russia would probably turn into a constitutional monarchy, since that was where it headed after the revolution of 1905. There's also alcohol being served openly during Prohibition, although it could be argued that in this timeline Prohibition never happened. In the fifth game, it's stated that Jazz originated in Harlem. While it's true that Jazz was especially popular in Harlem, it was really invented in New Orleans. Badass Creed: From the theme song. [Sakura] "We will fight for justice!" [Maria] "Even if we have to risk our lives for the sake of this war!" [Kanna] "We will stand our ground!" [Iris] "Someday, this imperial capital..."
[Kouran] "Till the day the evil disappears..."
[Sumire] "We will continue to fight in this war!" [All] "We are the Imperial Flower Attack Group!" Batman Cold Open: The opening to the fourth game shows the Teikokukagekidan stopping two runaway trolley carts. Batman Gambit: The Grand-Mère and Ambassador Sakomizu do this in the events of the École de Paris OVA by leveling empty houses near Lobelia's hideout to cut off several escape paths, which leads her into an ambush conducted by the Préfecture de Police de Paris. This was followed by the use of ultrasonic devices to pin Lobelia onto the wall. Following her escape into the sewers, more Préfecture de Police de Paris officers ambush her there with rifle grenades and cryotorpedoes to get her guard down and severely lower her spirit energy by making her use her pyrokinesis powers. Ambassador Sakomizu fires an anti-spirit bullet from a sniper rifle to paralyze her so that the police can easily capture her before she is incarcerated in prison, which would lead to her recruitment in the Paris Assault Force by Ogami in the events of Sakura Wars 3. Big Damn Heroes: Things are looking bleak for the PariGumi in Chapter 7, when out of nowhere comes Sakura, Sumire and Iris in their kohbus, and starts to wipe the floor with the baddies, despite being underpowered (compared to the Kohbu F models)! The PariGumi gets to pull this one off after Soletta and Leni are captured by the enemy; only, Kayama ends up being the one to actually save the both of them. Again with the PariGumi, only this time they come to the Flower Division's rescue, in 4. Of course, this was only after Ohgami's Paris heroine convinced him to order the PariGumi to launch and come to their aid. Bittersweet Ending: In the Le Nouveau Paris OVA, the PariGumi defeated the count and his plans to destroy Paris, but it's implied that a lot of death and destruction was done by the time Erica used her spirit powers to "save" him. While Paris rebuilds the Eiffel Tower, the count's benefactor responsible for breaking him out of confinement is still on the loose in France. But Not Too Foreign: Despite Five-Token Band being a major selling point of the series, many of the cast are either Japanese or of partial Japanese descent. The first team only had two characters without any Japanese descent, with blond-haired, blue eyed Maria being half-Japanese. In the second game, Orihime Soletta, is half-Italian, half-Japanese. The other newcomer Leni is wholly German, however. The third game has Hanabi Kitaouji, a half-French, half-Japanese noble. In Sakura Wars 5, which is set in New York, not only is the main character Japanese, but so are Subaru and the merchant you can get special bromides from. Mission Control member Anri is also half-Japanese, and Sunnyside and Gemini are Americans who are fans of Japanese culture. The Captain: Oogami and his nephew, Shinjiro, are talented, but just fresh out of OCS and have no practical experience yet. Child Soldier: Most members of all three Flower Division s are, at the oldest, in their late teens or early twenties. Iris and Coquelicot are the most notable, being preteens. Chilly Reception: Ogami in the games. Sakura in the TV series/OVA. Shinjiro in So Long, My Love. Ogami is belittled and used as errand boy as part of a Secret Test of Character, Sakura is mocked and looked down upon as a newbie Country Mouse, and Shinjiro isn't who the Star Division wanted - perhaps ironically, he's put through much the same as his uncle endured (except with more hostility, given that Hot-Blooded Cheiron and Emotionless Girl(?) Subaru are the ones putting him through his paces) because they expected to be see Ogami himself. Colour Coded Characters: Very much so. Not only their uniforms, but also their outfits, and sometimes even their special attacks, to an extent. Continuity Nod: The manga has many of these, sometimes bordering on Dis Continuity Nods — like a lighthearted Take That! at the redesigned kohbu from the PS2 version of the first game. In Sakura Wars V, Gemini mentions that she once saved America with the help of some friends back home some time before that game started. Assuming she's referring to the events of Episode V-0, Western players are unlikely to get the reference. In the same game, Sakura meets up with Taiga after his transfer to Tokyo from the Imperial Japanese Navy's academy prior to meeting with the "commander" of the Imperial Assault Force. Back in 1, Sakura meets Ogami in the same way. Sumire's first scene in 1 has her asking Ohgami to get a replacement fork for the one she dropped. Guess what Sumire's first event with Ohgami involves, in 3. The angel who shows up during Erica's special skill in 3 looks rather familiar. That's because it happens to be Ayame. Ohgami asks why the Baragumi are still staying with the Flower Division, and their response to his question is pretty much familiar if you've ever heard Geki!Tei in full. One of the training Blanches seen in the Sakura Wars 3 OVA has markings that Douglas-Stewart was the main manufacturer. Guess who gets involved as a major bad guy in the animated movie? Cool Ship: Syougeimaru and Mikasa. Cool Train: Apparently mandatory for the series. Dating Sim: One of the main trademarks of the franchise. Demonic Invaders: The existence of the Kouma and their attempted attacks on Earth. Official material suggests that they started to appear first in pre-Meiji Japan. Determinator: Everyone to an extent, but mostly Ohgami. In 4, there is a part where the boss disables everyone's kohbu, so everyone else is down except for him, and he has a few seconds left before he himself gets taken out of the fight. So what does he do? Fly right into the enemy's face, stab at it with his kohbu's swords, then get out of the pilot's seat moments after his kohbu has been totally wrecked, only to stab his sword at the monster's face. Followed by an Unflinching Walk out of the explosion that occurs. Dialogue Tree: Complete with timer to complicate the system; sometimes letting the timer run out [saying nothing] is the right thing to do! Establishing Character Music: When a main female character is introduced, their leitmotif plays in the background. Evil Is Hammy: Every single villain in the fifth game. Explosive Overclocking: Almost everything made by Kohran. Five-Token Band: The five ladies in your squadron in the fifth game consist of a white Country Mouse, a Sassy Black Woman, a young Hispanic bounty hunter, an Asian super-genius, and an Ill Girl in a wheelchair. Fluffy Fashion Feathers: Some of the stage outfits. Framed for Heroism: In the second OVA series, there is a point where Kohran, in costume as a character she plays on the radio, faces down a mecha with a prop gun; Maria is actually the one who makes the shot. 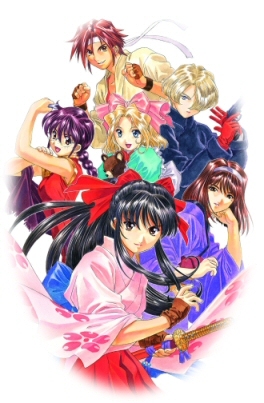 Gaiden Game: A few of them, although the most notable are Sakura Wars Story ~Mysterious Paris~", where players assume the role of a Japanese private eye named Kojiro Akechi and Miki Akechi, a dancer at the Chattes Noires. This was followed by "Sakura Wars V Episode 0 ~Kouya no Samurai Musume~", where players play Gemini prior to her arrival in New York City and "Dramatic Dungeon Sakura Taisen ~Kimi aru ga tame~", which takes place a year after the events of Sakura Wars V'', including the OVA. Gatling Good: Erica's upgraded Kohbu F2 sports a Gatling gun. Still comes with a cross. Gay Paree: The third game. Gender Flip: From 2010 to 2011, Red Entertainment created a two-game series called Scared Rider Xechs for the Playstation 2 (later ported to PSP). The series is a reverse harem equivalent of the Sakura Wars franchise. The game includes similar graphics, and mechs are involved in the storyline. Girls Love Stuffed Animals: Iris and her bear, Jean Paul. Gratuitous French: Played with in the original Sakura Wars games, but also prevalent in the Japanese and English versions of the École de Paris OVA. Heroic BSoD: Happens to Ohgami and his nephew Shinjiro after being recruited to join with the Tokyo/New York Fighting Troupes. They had a hard time at first since they were suppose to be officers in the IJN before they were relegated to employee duties, but they eventually got over it. Historical Villain Upgrade: Oda Nobunaga is the demonic Big Bad of Sakura Wars V.
You can say the same for Ranmaru, Tenkai, Ōkubo Nagayasu and Tutankhamen. Honest Axe: Rikkarita in Sakura Wars 5 is fond of asking criminals, "The gold gun or the silver gun... which do you want to get shot with?" Hot-Blooded: Ohgami, Sakura, Glycine. Ohgami even gets this as a rank 3. Humans Are Bastards: Oda Nobunaga certainly thinks so in Sakura Wars V.
Impossibly-Low Neckline: The way Sumire usually wears her kimono. Ink-Suit Actor: Akio Suyama and Chisa Yokoyama are really similar to Ohgami and Sakura respectively in Real Life, especially in theater plays. It's Raining Men: Prevalent in 4. This is also how the PariGumi arrive in Tokyo in their kohbu. Just Train Wrong: Despite the Combat Revues in Tokyo and Paris having bullet trains as a mode of transportation, there are a few things wrong with that. Japan developed the high-speed railway lines in 1964, with France following in 1981. They also weren't powered by steam, which ended around the same time that the bullet trains were being developed. Katanas Are Just Better: Quite a few characters wield long swords. Late-Arrival Spoiler: Players of the English release of the fifth game may feel like this is in effect as staple concepts are barely explained in the beginning. Being the fifth in a popular series, it assumes familiarity with them and the other divisions. Even some of the promotional material assured those who have somehow played earlier games that all of the systems they're familiar with and more are in this game but gave no such assurance for those new to the series. Let's Play Spirit Armor's LP of Sakura Wars I has been ongoing for six years and is nearing completion. The man has pledged to do I-V, so at this rate he very well might have a Sakura Wars VI or even VII to deal with by the time he finishes V ( Although that last one might be unnecessary). The LP can be found here . He translated his entire playthrough for your enjoyment, so you'd better be appreciative. The Abridged Series: Inverted — in addition to the literal translation of actual game dialogue, Spirit Armor includes additional dialogue in most scenes that carries on in the finest traditions of Abridged Series. Market-Based Title: The franchise is known as Sakura Taisen in Asia. Outside, it's known as Sakura Wars. The Masquerade: The reason why the Japanese, French and American government allowed for the secret existence of the various anti-demon Assault Forces. The Musical: This starts to get confusing as it becomes a case of "A Show Within A Show Within A Show" at times. Aside from the in-game musicals performed by the various teams there have actually been several musicals performed in Takarazuka style (although it should be noted that these musicals do feature the majority of the male voice actots playing their respective characters too). What makes it even more special is that, unlike a lot of musicals based on anime/games, all the voice actors respectively play their characters leading to some very funny scenes such as the seiyuu who plays Ohgami being extremely short and Iris' voice actress makes a joke on it since she is taller than him. Usually a musical takes the form of two parts. The first part is a story that focuses on the characters themselves and the second part actually has the characters perform a play/musical such as Blue Bird. The latter got significantly longer as the musicals progressed. The Flower Division team naturally had the most musicals. The Paris and New York troupes did not get that many. In fact the Paris troupe only had one mini-musical made. Also noteworthy is the special stage show (and OVA) to say good bye to Sumire and her voice actress Michie Tomizawa, when Tomizawa decided to leave the franchise. Technically speaking though that didn't happen so much musical wise as she continued (and still does) to make guest appearances and even attends the live events. Voice acting-wise it's actually Orihime's voice actress Maya Okamoto who now doesn't attend them since she now lives in the USA when she moved there after 1999 to study theater note Although she did move between America and Japan before moving back to the latter (at least temporary). She finally returned in the 2011 Budoukan show. .
Mythology Gag: Maria's White Russian commanding officer Yuri having a physical resemblance to Ken Nakajima. Considering that Kosuke Fujishima did have a hand in character designs, this is not a surprise. Nepharious Pharaoh: Sakura Wars: New York has King Tut trying to take over New York City. During The Roaring '20s. And the only people capable of stopping him are a Magitek Steampunk spec-ops team who masquerade as a theatre troupe. Ninja Pirate Zombie Robot: Musical theatre + Humongous Mecha + Turn-Based Strategy + Dating Sim. Not Even Bothering with the Accent: Played straight in The Movie and with Orihime and Leni in the OVAs. Old Save Bonus Use the Same Memory Card on your PS2 that you saved Sakura Wars 1 with to play Sakura Wars 3 and Episode 5-0, and oh boy you'd be in for a world of fun!! The One Guy: Ohgami for Sakura Wars 1-4 and Taiga for Sakura Wars 5. Out of the Inferno: Ohgami did this once after his kohbu was totaled in ST 4. Parrying Bullets: In the first episode of the second OVA, Sakura manages to deflect a full barrage from a machine gun with her sword. Peacock Girl: At least one set of the stage outfits. Pimped-Out Dress: Many of the stage outfits, and some of the girls' evening dresses. Power Walk: After the PariGumi's last mission. Powered Armor: Ohbu, Kohbu, Eisenkleid, Jinbu, STAR, etc. The Power of Acting: Sumire. Pretty in Mink: Soletta, Lachette, Glycine. Psychic Powers: Most everyone, with Iris and Erica being the most overt. Diana also is supposed to have such strong powers that they're physically harmful to her, but she rarely has overt displays of them. Real Life Writes the Plot: The reason why the Sumire OVA was developed, given that her voice actress Michie Tomizawa was going to get married and retire. Rollerblade Good: Strangely enough, while kohbu have wheels built in their feet, only Glycine is shown using this feature in both combat and cutscenes. Rousseau Was Right: The games fairly unambiguously take the position that humans are innately good and just need proper guidance and support to avoid going astray. Genuine evil comes from external forces like demons or The Undead. Rule of Cool: Everything from punching acid out of the way from launching robots and airships from underneath city streets. Running Gag: Erica is repeatedly arrested by the police for running around in town with her machinegun. Also Erica's tendency to smash her head against poles, doors, or whatever nearby. This happens when she sleeps. Sumire and Kanna getting into arguments. Kayama showing up with a guitar to impress Ogami and the girls, despite having little knowledge of playing it. Rosarita using her pet weasel as emergency food. Shinjiro being forced to dress up as Peppermint or being given new nicknames by Michael. Samurai Ohgami, Sakura, Taiga; in a looser sense, Sumire and Gemini as well. Schizo Tech: 1920s psychotronic steam-tech battlesuits. At one point in the manga, an announcement is made at the beginning of a play: "Also, please turn off your steam mobile phones..."
When Ohgami is first transferred to Tokyo, he's only told about the theatrical side of the Flower Division, as a test to see whether he's compatible with the group outside of battle, and the kind of person they'd be willing to follow in battle. Also, near the end of So Long, My Love, Mr. Sunnyside informs Taiga that he will have to sacrifice one of the members of theStar Division if he is to defeat Nobunaga. In the end, it turns out that the correct choice (and the one Taiga makes) is to ignore Sunnyside and vow to keep everyone alive. Shout-Out: The Kohbu-launching Revolver Cannon built into the Arc de Triomphe is suspiciously similar to a certain giant hero-launching revolver built into a pizzeria. Considering that Satoru Akahori was a writer for both works, it's likely an intentional reference. Chapter 4 of V has a few parallels to The Birds. The title "Sakura Wars: École de Paris" is a shoutout to the School of Paris group of artists. Sliding Scale of Idealism vs. Cynicism: You'd be hard pressed to find any work produced from the 90s onwards that is this far up the scale of Idealism. That said, Sakura Wars 3 shifts matters a bit further towards cynicism in the introduction of previously mentioned Boxed Crook Lobelia, brought onto the team in exchange for a reduction of her thousand year prison sentence and explicitly threatened with death if she messes up. To quote a line from her first episode. Steam Never Dies: Quite a few trains as well as cars, boats and planes are powered by steam engines, and the series is set during the time where steam-powered vehicles were being phased out. Steam Punk: Despite the games being set in the 1920s, it seems society hasn't moved to Diesel Punk or oil-based fuels yet. Instead, the mechs are powered by steam as well as spirit energy. Things are also closer to the bright and optimistic Gay Nineties versus the actual time period following World War 1 (which never happened here anyway). Super Robot Genre: Girls in mystically powered steampunk mechs vs. demons is the premise after all. Suspiciously Similar Substitute: Kaede Fujieda from Sakura Wars 2, for her sister Ayame. Takarazuka: The Flower Division perform as an all-female troupe; the "Teikoku Kagekidan" and its subdivisions are a Shout-Out to the famous Takarazuka Revue , or "Takarazuka Kagekidan". They are also partly based on the Schochiku Kagekidan wich was one of Takarazuka's first competors, the TKD's theatre is on the same spot and has the same design of the (now demolished) Shochiku Theatre, Ouji Hiroi's aunt was a founding member of Shochiku and while the flower for Takarazuka is the Sumire (the established Top Star in the games), the Shochiku theatre's flower was the Sakura, so their rivalray is representitive of the rivalry of the two theatres. Team Shot: Deconstructed. After every battle, the heroines (and Ogami) pose for a photo with the tagline "Shouri no POSE, kime!" (Roughly, "Victory Pose, Go!"). Ogami finds this somewhat awkward the first couple of times it happens. Every time new characters are introduced, they also find it incredibly dumb - but a couple of battles later, they're happily joining in. The high-water mark is in the third game, where Ogami is assigned to command a new team of girls - and is left as the only one posing, whilst his new comrades-in-arms recoil in confusion. Glycine: Huh? What's that supposed to be? Erica: Mr. Ogami, what are you doing? Theme Naming: Flowers for the Flower Division; stars, constellations and the like for the Star Division. Timed Mission: Some of the battles involving the demons must be cleared within a limited time. Time-Limit Boss: Some of the bosses must be defeated within the time limit. If you let the timer run out, it can trigger a Game Over and force you to restart the battle. Title Drop: Yoneda's soliloquy at the end of 4. Also doubles as a Tear Jerker. The Unwanted Harem: Ohgami's relationship with the girls — a leftover from the "dating sim" part of the original games. Virgin Power: Hinted at, though never explicitly stated. The main theme does state that the girls are maidens, and even a member of the PariGumi who gives off an "experienced" vibe — Lobelia — is, in her OAV focus story, explicitly stated to have not done the sorts of things that men and women normally do together when she took men up to her room, and is compared to the Virgin Mary. Video Game Cruelty Potential: Some of the dialogue choices you can make range from jerkish, to outright cruel. Though, in the long-run, making those choices can severely weaken your allies in combat and make the games nigh impossible to complete. Vitriolic Best Buds: Sumire and Kanna could be the poster children for this trope. Weapon of Choice: Mostly everyone. Weddings in Japan: Sakura's participation in a traditional ceremony at the end of The Radiant Gorgeous Blooming Cherry Blossoms OVA. Who Wears Short Shorts? : Sumire is shown wearing a pair backstage at several points in the manga. Consider that women often wore shorts backstage back in the day, as evidenced by pre-Code musicals such as The Broadway Melody and 42nd Street, and it really isn't as anachronistic as it seems. Wiper Start: In the second OVA series, Iris ends up stealing Dandy Boss's boat after leaving rehearsals of The Blue Bird in frustration. Unfortunately for her, she doesn't know how to operate it and almost causes it to crash into a water control gate. Leni, who has been searching for Iris, commandeers the boat to rescue Iris and makes it across the gate. Zettai Ryouiki: The Paris Kagekidan uniforms.